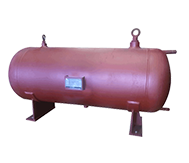 TM Filtration offers a variety of air/gas receivers and vessels. All vessels are in accordance with ASME Section VIII, Division 1 where “U” stamp is available. TM can also create custom air/gas receivers to fit your needs. Notes: Body material, connections, available options, and dimensions are completely customizable. Dimensions and options availability are subject to change without notice. Please consult the TM Sales Department or your local sales representative for certified drawings, or additional information.